Thank you to all who gave generously by buying raffle tickets at the recent Radio Ceredigion Local Heroes Awards held at the Cliff Hotel Cardigan. Proceeds from the raffle amounting to £527 were presented to representatives of DASH. 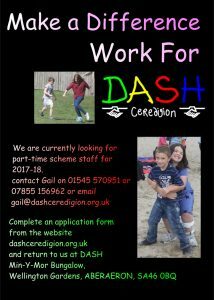 Stepping Stones Parent and Toddler group have supported DASH again! A big thank you for the donation of £50 received in October. We want to say we’re truly sorry for any problems that you and your supporters may have experienced when trying to vote for your Aviva Community Fund projects. To try and help make up for any disappointment these problems might have caused, we’ve put an extra £200,000 into the Aviva Community Fund prize fund which will benefit additional projects across the different fund levels. When voting opened we were overwhelmed by the amazing volumes of people trying to vote. Good as they are, even our systems struggled to cope with the huge response – and that slowed things down for people trying to vote on Tuesday morning. Unfortunately we then experienced an unrelated issue on Thursday which meant that access to voting had to be restricted. We know that this must have been very frustrating for many of you who have worked so hard to encourage your supporters to vote for the projects they care about so passionately. Voting will be open until midday on 21 November and the projects with the most votes at that point will become our finalists. Thank you for helping us to support the UK projects that mean so much to you and your communities.